At least 13 people were killed and more than 30 others injured when a passenger bus overturned on a highway in North Macedonia on Wednesday, health minister said. "Thirteen people were killed," Minister Venko Filipce told reporters. "There are more than 30 injured." Speaking to AFP, Filipce added that "the number of dead may increase because there are people in surgery and in critical condition" following the accident which happened around 20 kilometres (12 miles) from the capital Skopje. Ilir Asani, head of the emergency centre at Skopje's main hospital, told local media that at least "five people were severely injured, including a pregnant woman". 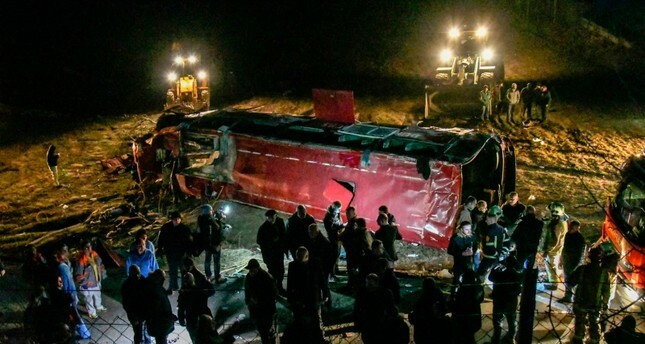 A public prosecutor said it had launched a probe into the accident that occurred "when a bus of the company 'Durmo Tours'... crossed the barrier on the opposite side of the highway, then veered off the road and overturned near the village of Laskarci". Health Minister Venko Filipce said some victims were dead at the scene and others died after they were taken to a hospital. The bus was carrying about 50 people when it overturned late Wednesday on a highway linking Skopje with the town of Tetovo. The cause of the accident isn't yet known.